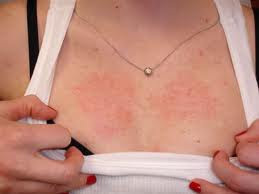 Rash is a symptom that causes the affected area of skin to turn red and blotchy, and to swell. A rash may cause spots that are bumpy, scaly, flaky, or filled with pus. Rashes can vary in location, pattern and extent and may occur in any area of the body. A chest rash can have a variety of causes, and it may indicate something occurring around the chest itself or suggest a systemic (body-wide) condition. Contact dermatitis (skin inflammation) is caused by an adverse reaction to something that touches the skin, including chemicals found in detergent, soap or a fragrance. For example, you may develop a rash on your chest when you wear a shirt that was washed with a particular detergent or treated with a chemical. Metal, such as a necklace rubbing against your chest, can also cause chest rash. Other forms of contact dermatitis include exposure to certain plants, such as poison oak or ivy, an animal bite, or an insect sting. Lyme disease is caused by tick bite, which can first appear as a circle with a bull’s-eye pattern, then progress to a rash. 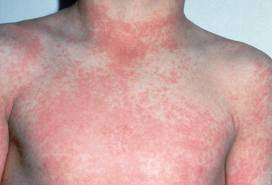 Allergies to food and medications are potentially serious sources of rash. Peanuts, shellfish, strawberries and avocados are just some of the foods that can trigger allergic reactions. These foods may cause mild reactions; however; in some cases, reactions could develop into potentially life-threatening conditions characterized by vomiting, difficulty breathing, or swelling. Allergic purpura is a serious, often life-threatening allergic reaction that can cause a chest rash but can also affect the joints, gastrointestinal tract, and kidneys. Rashes may also be associated with in skin conditions, such as eczema, psoriasis and impetigo. Some of these are chronic skin conditions that may flare up for a time, then resolve. Other causes of rash include autoimmune disorders that occur when the body is attacked by its own immune system, which normally serves to protect it from foreign invaders (antigens). 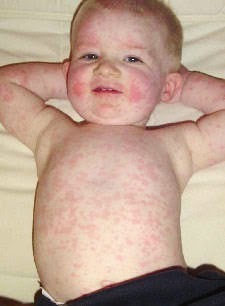 Many viruses that occur during flu season, or those associated with childhood diseases, can produce rash. Rashes can be caused by an allergic reaction to food, medications, lotions or detergents. These reactions can range from mild to potentially life threatening, especially if swelling and constriction of breathing occurs, which could indicate anaphylaxis. Seek immediate medical care (call 911) if a rash is accompanied by any of the following symptoms, including swelling of the face, swelling and constriction of the throat, difficulty breathing, fainting, change in level of consciousness or alertness, pale skin, or purple rash. The purpose of this site section is threefold: to help you recognize several of the most common childhood rashes, to help you figure out what the cause of your child’s particular rash might be and how to treat it, and most importantly to help you decide if a rash is dangerous and requires an urgent page to your doctor or if it can wait until the next day to be evaluated.